Early Neoclassicals criticized Keynesian views about fiscal policy for ignoring the “crowding out” effect. Recall that crowding out is the idea that expansionary fiscal policy causes interest rates to rise which reduces business investment, limiting the effects of the fiscal expansion. The Keynesians ultimately acknowledged the crowding out effect, and the debate changed to how much crowding out occurs. Neoclassicals argue for complete crowding out, meaning that fiscal policy was completely ineffective since an increase in government spending would be completely offset by a decrease in private investment spending with no net effect on aggregate demand. Keynesians argue for incomplete crowding out; thus, fiscal policy would be weaker than originally thought, but still effective to a certain degree. The theory that rational private households might shift their saving to offset government saving or borrowing is known as Ricardian equivalence because the idea has intellectual roots in the writings of the early nineteenth-century economist David Ricardo (1772–1823). If Ricardian equivalence holds completely true, then any increase in government expenditure that increases the budget deficit would lead to a corresponding decrease in consumption expenditure, as households save more in anticipation of their future tax liability. The net effect on aggregate demand then is zero and fiscal policy is entirely ineffective. In practice, the private sector only sometimes and partially adjusts its savings behavior to offset government budget deficits and surpluses. 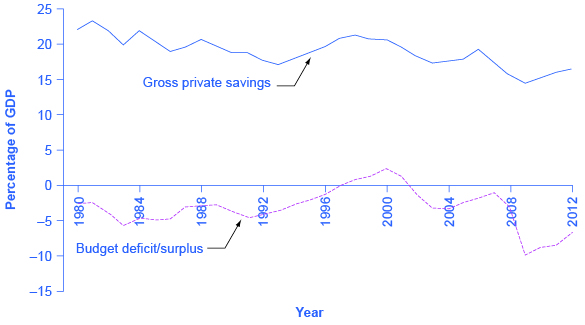 Figure 1 shows the patterns of U.S. government budget deficits and surpluses and the rate of private saving—which includes saving by both households and firms—since 1980. The connection between the two is not at all obvious. In the mid-1980s, for example, government budget deficits were quite large, but there is no corresponding surge of private saving. However, when budget deficits turn to surpluses in the late 1990s, there is a simultaneous decline in private saving. When budget deficits get very large in 2008 and 2009, on the other hand, there is some sign of a rise in saving. A variety of statistical studies based on the U.S. experience suggests that when government borrowing increases by $1, private saving rises by about 30 cents. A World Bank study done in the late 1990s, looking at government budgets and private saving behavior in countries around the world, found a similar result. Figure 1. U.S. Budget Deficits and Private Savings. The theory of Ricardian equivalence suggests that any increase in government borrowing will be offset by additional private saving, while any decrease in government borrowing will be offset by reduced private saving. Sometimes this theory holds true, and sometimes it does not hold true at all. (Source: Bureau of Economic Analysis and Federal Reserve Economic Data). So private saving does increase to some extent when governments run large budget deficits, and private saving falls when governments reduce deficits or run large budget surpluses. However, the offsetting effects of private saving compared to government borrowing are much less than one-to-one. Thus, fiscal policy can be effective, though perhaps less so in the absence of Ricardian equivalence. In addition, this effect can vary a great deal from country to country, from time to time, and over the short run and the long run. Fiscal policy doesn’t always work as designed, Some of these reasons are because businesses and consumers preempt policy changes or act in unpredictable ways. Consumers may demonstrate Ricardian equivalence by choosing to save money from a tax cut, which would cause no shift to aggregate demand and have no effect on the multiplier. Watch the selected clip from this video to learn more. The video beings by diving into ways that businesses may act in ways that offset fiscal or monetary policies.